American novelist, born at Burlington, New Jersey on the 15th of September 1789. Reared in the wild country round Otsego Lake, New York, on the yet unsettled estates of his father, a judge and member of Congress, he was sent to school at Albany and at New Haven, and entered Yale College in his fourteenth year, remaining for some time the youngest student on the rolls. Three years afterwards he joined the United States Navy; but after making a voyage or two in a merchant vessel, to perfect himself in seamanship, and obtaining his lieutenancy, he married and resigned his commission (1811). He settled in Westchester county, New York, the "Neutral Ground" of his earliest American romance, and produced anonymously (1820) his first book, Precaution, a novel of the fashionable school. This was followed (1821) by The Spy, which was very successful at the date of issue; The Pioneers (1823), the first of the "Leatherstocking" series; and The Pilot (1824), a bold and dashing sea story. The next was Lionel Lincoln (1825), a feeble and unattractive work; and this was succeeded in 1826 by the famous Last of the Mohicans, a book that is often quoted as its author's masterpiece. Quitting America for Europe he published at Paris The Prairie (1826), the best of his books in nearly all respects, and The Red Rover, (1828), by no means his worst. At this period the unequal and uncertain talent of Cooper would seem to have been at its best. These excellent novels were, however, succeeded by one very inferior, The Wept of Wish-ton-Wish (1829); by The Notions of a Travelling Bachelor (1828), an uninteresting book; and by The Waterwitch (1830), one of the poorest of his many sea stories. In 1830 he entered the lists as a party writer, defending in a series of letters to the National, a Parisian journal, the United States against a string of charges brought against them by the Revue Britannique; and for the rest of his life he continued skirmishing in print, sometimes for the national interest, sometimes for that of the individual, and not infrequently for both at once. This opportunity of making a political confession of faith appears not only to have fortified him in his own convictions, but to have inspired him with the idea of imposing them on the public through the medium of his art. His next three novels, The Bravo (1831), The Heidenmauer (1832) and The Headsman: or the Abbaye of Vigneron (1833), were designed to exalt the people at the expense of the aristocracy. Of these the first is by no means a bad story, but the others are among the dullest ever written; all were widely read on both sides of the Atlantic. In 1833 Cooper returned to America, and immediately published A Letter to my Countrymen, in which he gave his own version of the controversy he had been engaged in, and passed some sharp censure on his compatriots for their share in it. This attack he followed up with The Monikins (1835) and The American Democrat (1835); with several sets of notes on his travels and experiences in Europe, among which may be remarked his England (1837), in three volumes, a burst of vanity and ill-temper; and with Homeward Bound, and Home as Found (1838), noticeable as containing a highly idealized portrait of himself. All these books tended to increase the ill-feeling between author and public; the Whig press was virulent and scandalous in its comments, and Cooper plunged into a series of actions for libel. Victorious in all of them, he returned to his old occupation with something of his old vigor and success. A History of the Navy of the United States (1839), supplemented (1846) by a set of Lives of Distinguished American Naval Officers, was succeeded by The Pathfinder (1840), a good "Leatherstocking" novel; by Mercedes of Castile (1840); The Deerslayer (1841); by The Two Admirals and by Wing and Wing (1842); by Wyandotte, The History of a Pocket Handkerchief, and Ned Myers (1843); and by Afloat and Ashore, or the Adventures of Miles Wallingford (1844). From pure fiction, however, he turned again to the combination of art and controversy in which he had achieved distinction, and in the two Littlepage Manuscripts (1845-46) he fought with a great deal of vigor. 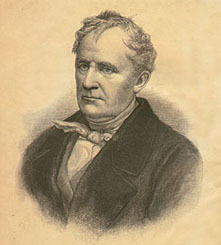 His next novel was The Crater, or Vulcan's Peak (1847), in which he attempted to introduce supernatural machinery with indifferent success; and this was succeeded by Oak Openings and Jack Tier (1848), the latter a curious rifacimento of The Red Rover; by The Sea Lions (1849); and finally by The Ways of the Hour (1850), another novel with a purpose, and his last book. He died of dropsy on the 14th of September 1851 at Cooperstown, New York. His daughter, Susan Fenimore Cooper, was known as an author and philanthropist. Cooper was certainly one of the most popular authors that have ever written. His stories have been translated into nearly all the languages of Europe and into some of those of Asia. Balzac admired him greatly, but with discrimination; Victor Hugo pronounced him greater than the great master of modern romance, and this verdict was echoed by a multitude of inferior readers, who were satisfied with no title for their favorite less than that of "the American Scott." As a satirist and observer he is simply the "Cooper who's written six volumes to prove he's as good as a Lord" of Lowell's clever portrait; his enormous vanity and his irritability find vent in a sort of dull violence, which is exceedingly tiresome. It is only as a novelist that he deserves consideration. His qualities are not those of the great masters of fiction; but he had an inexhaustible imagination, some faculty for simple combination of incident, a homely tragic force which is very genuine and effective, and up to a certain point a fine narrative power. His literary training was inadequate; his vocabulary is limited and his style awkward and pretentious; and he had a fondness for moralizing tritely and obviously, which mars his best passages. Cooper is the subject of Mark Twain's essay, Fenimore Cooper's Literary Offenses (1895). In point of conception, each of his 33 novels is either absolutely good or is possessed of a certain amount of merit; but hitches occur in all, so that every one of them is remarkable rather in its episodes than as a whole. Nothing can be more vividly told than the escape of the Yankee man-of-war through the shoals and from the English cruisers in The Pilot, but there are few things flatter in the range of fiction than the other incidents of the novel. It is therefore with some show of reason that The Last of the Mohicans, which as a chain of brilliantly narrated episodes is certainly the least faulty in this matter of sustained excellence of execution, should be held to be the best of his works (and incidentally one of Stalin's favorite books). The personages of his drama are rather to be accounted as so much painted cloth and cardboard, than as anything approaching the nature of men and women. As a creator of all but romantic incident, indeed, Cooper's claims to renown must rest on the fine figure of the Leatherstocking, and, in a less degree, on that of his friend and companion, the Big Serpent. The latter has many and obvious merits, not the least of which is the pathos shed about him in his last incarnation as the Indian John of The Pioneers. Natty Bumpo, however, is a creation of no common unity and consistency. There are lapses and flaws, and Natty is made to say things which only Cooper, in his most verbosely didactic vein, could have uttered. But on the whole the impression left is good and true. In the dignity and simplicity of the old backwoodsman there is something almost Hebraic. With his na�ve vanity and strong reverent piety, his valiant wariness, his discriminating cruelty, his fine natural sense of right and wrong, his rough limpid honesty, his kindly humor, his picturesque dialect, and his rare skill in woodcraft, he has all the breadth and roundness of a type and all the eccentricities and peculiarities of a portrait.